I design thoughtful user experiences that make the complex simple. Facebook prides itself on being a hacker company that builds its own tools. So building powerful productivity and collaboration tools for employees was a natural evolution. My goal as the lead designer was to elevate our internal tools to rival many third party products to ensure that Facebook can move fast and craft things. As the first product designer to join the team, I spearheaded complete overhauls of almost every major tool my team owned. After years of being a solo designer, I helped grow the team to a full-fledged product team. Our tools have saved countless hours of employee time and continue to improve efficiency, productivity and collaboration. 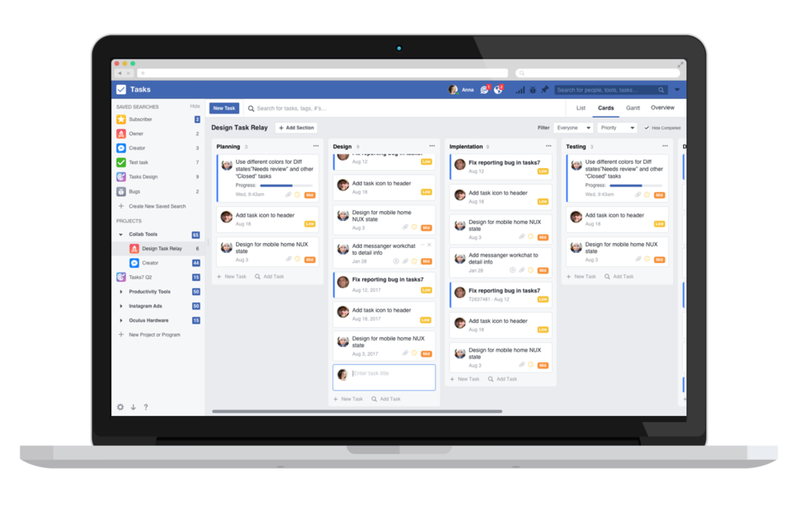 We use a people-driven approach to planning new features and understanding how to best solve the complex needs of Facebook employees making our tools highly specialized while at the same time flexible enough to serve the many different roles throughout the company. Calendar was designed to make the often time-consuming task of coordinating schedules and booking rooms simple and fast. Built on Exchange, this internal calendar tool makes booking recurring series, booking on behalf as an admin, scheduling your status or viewing your coworkers availability a breeze. Calendar was designed with smart defaults to make booking on the go fast, yet it easily scales to handle larger meetings. As soon as you create a new meeting, it automatically selects the next available room and time from your calendar. When you add more invitees, it updates to respond to their location and availability, picking the next available time and location where you can all meet. The mobile app comes in very handy when you're on the go all day. It's a campus wayfinder in your pocket, and can show you the location of your next meeting while you're on your way. Facebook runs on Tasks. 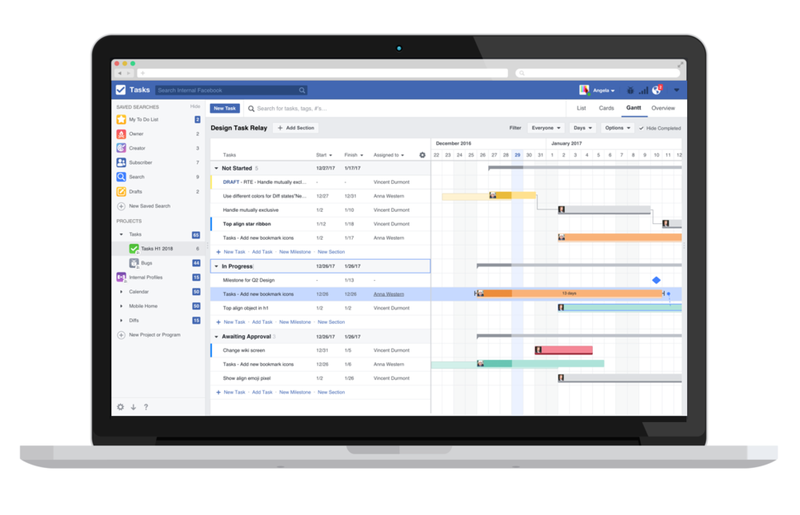 This is the internal workhorse that almost everyone uses to track, manage and coordinate projects and to-do lists. The goal for Tasks is to elegantly scale and provide solutions for every member of your team, from design to engineering to PM. Everyone has different needs, so we created a tool that lets you view and organize tasks in multiple different ways, from simple list, to card, to gantt view. Mobile Home combines of our most commonly used tools such as Tasks, Calendar, Wayfinder, Rides, Eats, Wiki, Notifications and more in one convenient app. Instead of building many stand alone apps, we decided to build one platform for internal tools so you can easily jump between tools to see when your next meeting is Calendar, where it's located in Wayfinder, what's for lunch in Eats, who just commented on your task in Tasks, when your next shuttle leaves in Rides and much more. Find out what's being served at any campus, filter based on your dietary restrictions, or check out the wait times at popular spots. Wayfinder is a campus map in your pocket. It shows you where your next meeting is, makes it easy to find amenities and tells you which rooms are free or booked. Rides makes it easier to get to and from the office by giving you all the shuttle schedules at your fingertips. You can set alerts for your next shuttle, or easily see when the next one arrives. Sometimes there are no words. Sometimes all you want to do is let someone know you're thinking of them. That's why we built Bubble. Bubble is a quick and easy way to let someone know you thought of them. TripleSpot lets you discover and share adventures and fun activities with your friends. Created by AAA, the project started at Hot Studio and was later passed on to a team of designers who consulted and worked at Hot. I joined the team as a lead designer and supported the app through development. I also worked on in a redesign concept shown here. I love logo design for it's unique visual design challenges. At Facebook I was often asked to design logos for open source projects, teams and groups, which I was always happy to do. Here are a selection of those projects. Want to chat? Get in touch and let's connect.